This superb value holiday gives you the chance to escape the British winter, relax in a pretty white-painted village overlooking the Costa del Sol and enjoy some of the wonders of Andalucia. Five nights are spent in delightful Mijas Pueblo, and two in magical Seville. In winter and early spring, southern Spain is warm and sunny, though the stifling temperatures of high summer are still some time away – this is the perfect time to take in some of the remarkable sights of Andalucia. Day One: Flight to Malaga. On arrival transfer to your hotel in Antequera (approx. 50 minutes) for four nights half board accommodation. At the crossroads between Malaga and Cordoba, and Seville and Granada, Antequera is ideally situated for visiting Andalucia’s main sights. But it’s also an interesting town in its own right. Throughout the city centre its Spanish, Roman, and Moorish influences are ever-present. The stunning collegiate church of Santa Maria la Mayor rises just below the Moorish fortress. There are over thirty churches, including the impressive Spanish-Baroque Iglesia del Carmen, and a network of picturesque alleys, shady squares, and tapas bars to enjoy. There are two included excursions during your stay in Antequera. The first excursion is a short half-day excursion, to allow you to get you your bearings in Antequera and to visit El Torcal, a natural area of amazing limestone rock formations. Just 23 miles total. The second excursion is to Granada. Just sixty easy motorway miles away, there is surely no more spectacular setting than Granada whose extraordinary Alhambra complex is dominated by the snow-capped peaks of the Sierra Nevada. A local guide will ensure you make the most of your visit to the Alhambra and the Generalife Gardens. (Please note that, due to restrictions on group visits, the Nasrid Palaces part of the complex may not be included in the visit.) As well as visiting the complex, you will also have plenty of time to see some of the city’s other attractions such as the cathedral and the old Moorish quarter of Albaicin, now – like with the Alhambra and the Generalife – a UNESCO World Heritage Site. 120 miles round trip. Day Five: Today you travel towards Seville, but first visit Cordoba, one of the not-to-be-missed sights of Andalucia, where, 1000 years ago, Jews, Arabs and Christians lived side by side in harmony. You will see a statue of Maimonides, the famous Jewish philosopher and the author of Mishneh Torah. You will also visit the world-famous Mezquita, accompanied by a local guide. The church/mosque was founded in 785 by Abd ar-Rahman I, and then adapted and adopted by the Christian Kings of Spain – who built a cathedral inside it! You will also have free time for lunch and sightseeing before continuing to Seville for two nights’ bed and breakfast accommodation. 154 miles today. Day Six: Morning walking tour of Seville with local guide. 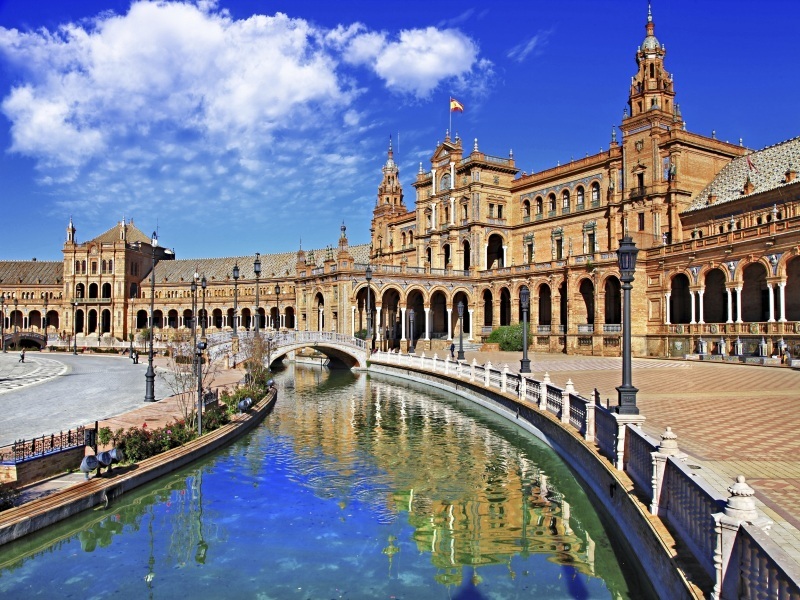 In a splendid location on the Guadalquivir River, Seville is a lively city and the capital of Flamenco. Wandering through the narrow streets you will soon understand how Seville inspired Bizet’s Carmen and Mozart’s Marriage of Figaro. The afternoon is free. You may want to visit the Cathedral, the Giralda or the Alcazar, and, in the evening, take in a Flamenco show. Day Seven:Today you leave Seville and drive through the scenic Sierra landscape to Ronda whose spectacular 600ft deep Tagus Gorge is spanned by the spectacular Puente Nuevo (new bridge). The city’s bullring in the ‘’new’’ town is 230 years old, about the same age as the new bridge! You will have free time for sightseeing in this interesting, atmospheric and dramatic city. You then continue to Malaga, arriving in time for a short tour of Picasso’s home-town where you spend the last night of your holiday on a bed and breakfast basis. 135 miles today. Day Eight: Transfer to the airport (25 minutes) for your return flight.